SciFest national champion, Aaron Hannon from St Muredach’s College, Ballina represented Ireland at Intel ISEF 2018 in Pittsburgh, Pennsylvania this week where he received a first in his category, Embedded Systems. Intel ISEF is the world’s largest international pre-college science competition, involving some 1,700 students from over 75 countries competing for a prize fund totalling $4million. 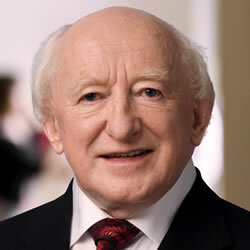 The SciFest programme is funded primarily by Science Foundation Ireland (SFI) , Boston Scientific and Intel Ireland. 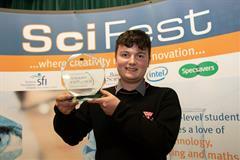 Aaron secured his place at the international competition when he won the top award, the Science Foundation Ireland Intel ISEF award, at the SciFest 2017 national final last November. Aaron’s winning project was a device designed to assist people with limited hand dexterity to shave. The project was inspired by Aaron’s late grandfather who suffered from limited hand dexterity due to a stroke. It is a fully functional device capable of shaving facial hair for people with limited use of their hands. The device is user friendly and was created through technical research to develop the physical, electrical and software aspects. 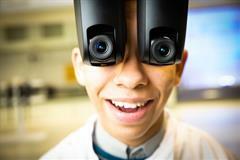 A mannequin head was used to test the device and an android app was designed to allow greater ease of use. SciFest is an all-island STEM (science, technology, engineering and maths) initiative which fosters active, collaborative and inquiry-based learning among second level students. It is free to enter and being locally and regionally based it is both accessible and inclusive.